International Journal of Environment and Geoinformatics (IJEGEO) is an interdisciplinary, double peer-reviewed (blind) journal, published tri-annually in April, August and December since 2014. The journal publishes research articles, short communications and review articles in English from all areas related to geoinformatics and environmental sciences. IJEGEO is an OPEN ACCESS journal and does not charge any article submission and processing fees. Authors should get ORCID ID (https://orcid.org/register) before submitting their manuscripts. On behalf of the organizing committee, we would like to invite you to the International Symposium on Applied Geoinformatics (ISAG2019 http://www.isag-2019.yildiz.edu.tr/ ), which will take place at the Yildiz Technical University, Davutpaşa Campus, Istanbul, Turkey, on November 7-9, 2019. 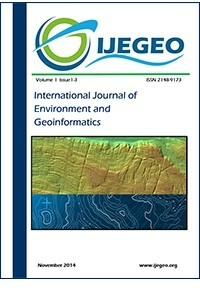 IJEGEO is one of the official journals of the "INTERNATIONAL SYMPOSIUM ON APPLIED GEOINFORMATICS"